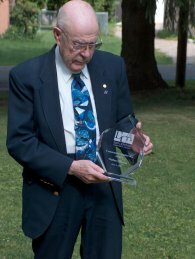 Today is the 93rd birthday for Wally Horton, the person best described as the grandfather of the Newark Air Force Base and Central Ohio Aerospace & Technology Center. Wally is one of those leaders whose impact is George Bailyesque. It's hard to imagine Licking County in the last 50 years without the impact Wally has had. The Newark Air Force Base came to be much at Wally's hand. He helped guide the decision to bring the Air Force work here as far back as 1958, moved his family here to help it get going in 1962, and stayed on as its top civilian into the early 1970's. The economic impact on the community of that location decision is measured in the billions of dollars over all these years. Thousands of families have made their livelihoods here and generations have benefitted from the good-paying jobs it brought. And its still here and going strong. In 1993, when the Newark Air Force Base was on the closing list, Wally re-emerged. He fought hard for privitization in place and led the charge that saw the Port Authority be created by Heath, Newark, and Licking County in order to preserve the jobs and impact of the base. Today, fully 15 years later, the Port Authority is the largest, self-supported port authority in Ohio and fourth largest overall. When base closure is imminent and a community looks for leaders who will ensure the economic impact of the facility is maintained and the best possible outcome for the community is achieved, it looks for a team of people that includes someone who knows the history and military importance of the installation, someone who understands the niche and unique capabilities of the installation’s workforce, someone with the charisma and capability to rally the local community and the congressional delegation, and someone with the managerial skills to develop and implement a reuse plan. In the case of the former Newark Air Force Base in the community of Heath-Newark-Licking County, Ohio, that team of people was one man—Wally Horton. Mr. Wallace Horton, as a community leader, is the person all communities facing base closure should seek to emulate. Through his dedication to his community and his firm, unwavering belief in the uniqueness and military value of the installation that he helped found, Wally was four people in one and helped retain an installation that today, 12 years after the announcement of base closure, is a success story with a $200 million annual impact on Central Ohio and a model for successful base closure.